Edmund Lewis and Zuzanna Szadkowski in Uncle Romeo Vanya Juliet. Photo by Ashley Garrett. BOTTOM LINE: This mash-up of Uncle Vanya and Romeo and Juliet fails to convince that anything is gained by performing the two together. The question that I kept asking myself while watching Bedlam's Uncle Romeo Vanya Juliet is "Why?" If you're going to mash up two classics that hold up on their own like Romeo and Juliet and Uncle Vanya, you should have a good reason. Sure, when you watch either one, you think that falling in love is terrible and only ends in death or misery, but this play combo never gets much deeper. In addition, it's really more of Uncle Vanya with a few scenes of Romeo and Juliet thrown in, so the whole experiment feels almost like an afterthought, and the transitions between the two are sometimes awkward and confusing. It's easier to follow if you're familiar with both plays. A quick refresher: Romeo and Juliet are in love and determined to be together even though their families despise each other. Whereas in Uncle Vanya, most of the characters are bitterly unhappy—Vanya is in love with Yelena (his brother-in-law's wife), but realizes that he has wasted his life. One can imagine that in his youth, Vanya might have been like Romeo, and if Romeo hadn't died, he might have ended up like Vanya, so it makes sense that they are both played by Edmund Lewis (in the program, everyone's roles are listed as "ensemble"). Zuzanna Szadkowski plays both Juliet and Yelena. But because the show itself is so surface-level, the performances are too. 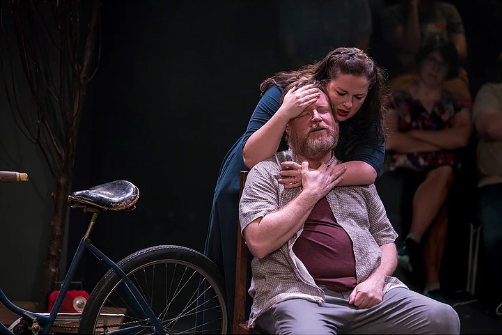 It doesn't help matters that this production opens so soon after Richard Nelson's Uncle Vanya, in which Jay O. Saunders gave the definitive performance of the title character. Bedlam's Artistic Director Eric Tucker directs in typical Bedlam fashion—people break out into modern songs and dance numbers, and there are many silly props. But rather than charming, this all just makes Uncle Romeo Vanya Juliet feel even longer. Bedlam is known for innovative takes on classics (and some of their earlier work more than succeeded in this), but lately I've found their work indulgent. Maybe they are enjoying themselves, but they should ask themselves why the audience should care. (Uncle Romeo Vanya Juliet plays at A.R.T./New York Theatres, 592 West 53rd Street, through October 28, 2018. The running time is 2 hours 30 minutes with an intermission. Performances are Tuesdays at 7; Wednesdays at 2; Thursdays and Fridays at 7; Saturdays at 2 and 7; and Sundays at 7. Tickets are $59-$89 and are available at bedlam.org or by calling 866-811-4111. Uncle Romeo Vanya Juliet is by William Shakespeare and Anton Chekhov. Uncle Vanya adapted by Kimberly Pau. Directed by Eric Tucker. Set Design by John McDermott. Lighting Design by Les Dickert. Costume Design by Charlotte Palmer-Lane. Sound Design by Karin Graybash. Production Stage Manager is Violeta Picayo. The cast is Edmund Lewis, Susannah Millonzi, Randolph Curtis Rand, Zuzanna Szadkowski, and Eric Tucker.